BASE Gear (dacron lines for slider down). Bring at least one - two rigs required for the course. rental gear available. Pilot chutes: 46", 42" and 36"
If you plan to jump your 2 piece tracksuit, do at least 50 skydives with it. Train accuracy landings with your base canopy or a big student canopy. If you need a ride we can offer transportation. There are 6 slots available. 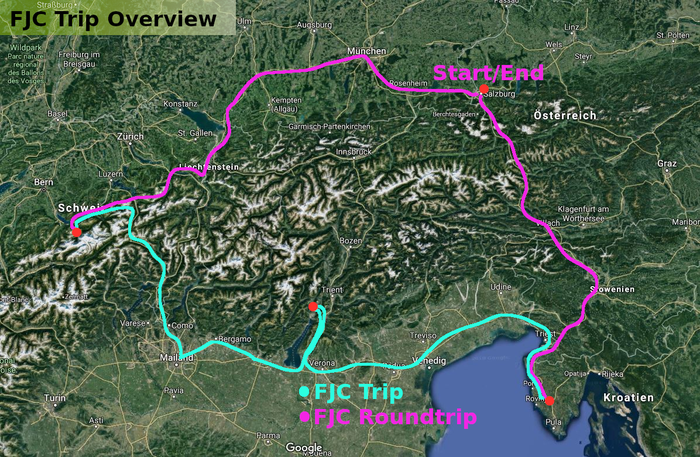 Our trip will be a round trip starting/arriving in Salzburg/Austria. You can join us from Salzurg Airport or Kanafanar/Croatia.